Not only is hair product build-up not a pretty sight to see, it can be damaging over time. It takes away your hair's natural sheen and can make hair look stressed out and dirty. Product build-up also prevents hair from growing (it clogs the hair follicle). From time to time, all of us have noticed build-up in our hair. Or, maybe your hairdresser has informed you that you should start using silicone-free products to help rid of it. 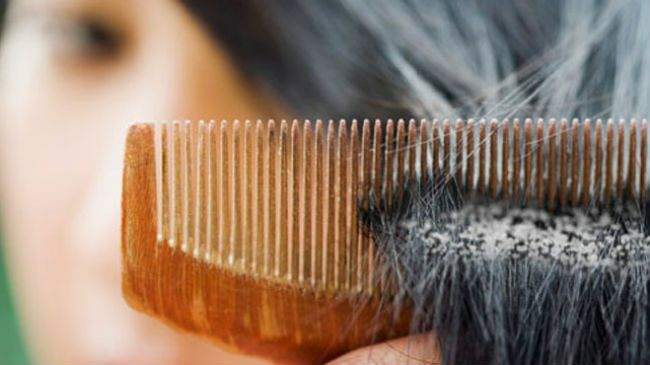 Before buying in to those expensive treatments and other unnecessary sales pitches, try some of these very simple ways to remove unwanted build-up while not stripping hair of its natural oils. Vinegar has amazing cleansing properties that does wonders for product build-up. Simply combine 1/4 cup of apple cider vinegar, 1 gallon lime juice and 1 gall of water together. After shampooing your hair, pour about 2 cups of the mixture over your scalp and allow it to saturate your entire head. Work the mixture through your hair with your fingers then rinse with cold water. Store the leftover mixture in your fridge and use it every 2-3 weeks to keep your hair healthy and clean. You can also try this method with malt vinegar and allow it to soak into hair for up to 30 mins, followed by your regular wash and conditioner treatment. Baking soda is another household item that can aide in cleaning your hair. Mix two parts of baking soda with one part of water in a large bowl then apply the paste to your hair in a thick layer. Leave the paste to soak into hair for up to a half hour then rinse, shampoo and condition as usual. Dispose of any extra mixture as it can only be used once. Shampooing with dish soap can rid of heavy build-up and add body to your hair as well. After shampooing with the dish soap, follow with your regular conditioner and leave the conditioner on for an extra 5-10 minutes. This may be harsh for some curls, so test this out on a small section of your hair first to see if it agree with you. These treatments will leave your hair free of build-up, looking more healthier and feeling much cleaner. And, your hair will be able to grow! Writer Tara Lisciandro-Hornich is a Type 2/Type 3mom to a curly daughter as well as healthy lifestyle advocate.